Very pretty pale pink, just what i wanted. Soft and a good weight too!! I planned on using for winter but since i'm not a fan of central air i might just use it all year long! Elevate your bedroom with this elegant bedding set. Featuring a pinch pleat pattern, the set is available in a range of gentle colors to complement your decor. The soft, hypoallergenic microfiber ensures warmth and comfort. First I purchased this in queen-sized in the gray color for my queen-sized bed but it was too short on the sides for my liking so I returned it and purchased the king-sized in white. It’s beautiful. The gray was a nice color but the white is so clean and beautiful. I purchased king-sized pillows to fit the king-sized shams for my queen-sized bed and it looks perfect. It’s soft, fluffy and warm. 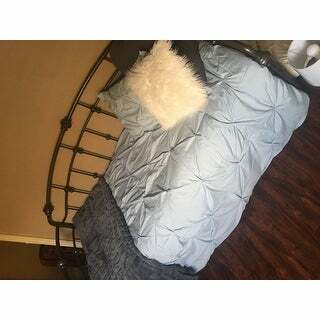 Don’t hesitate to purchase this comforter from ***. It’s only been washed once but if it ends up not being built to last, I know *** return policy can’t be beat! I bought this comforter for my teen daughter. She loves the color and the pinch pleats. We found this comforter on other websites for 3X the price on Overstock.com. Very beautiful set. I love the pinch pleats which makes the comforter and pillow shams look gorgeous but simple. It is just what I wanted. The truly soft pinch pleat solid 3 piece comforter set is the perfect color for my daughter's bedroom. It is so soft and fits the bed perfectly. Fast shipping and great price. Love the comforter and pillow sham for my daughter's XL Twin dorm bed. Looks super cute with her decor. Goes with anything. One drawback is that it is white and need to be careful about stains. Has held up great. This comforter is soft, light, beautiful, and comfortable! 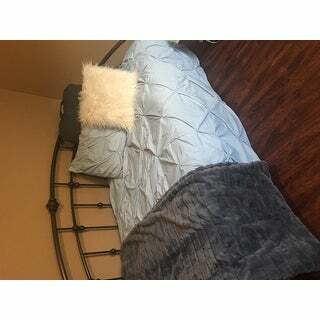 When I was looking online, I could not find any reviews regarding the type of blue that the comforter is; the blue is a light, pale blue like the displayed pictures. I truly enjoy this product and am planning to steam the wrinkles out. Super soft and cozy. Looks great. Good quality. It wasn’t wide enough for my king size bed. Not sure why as I have a standard king mattress. It looked great on there but I had to return it because you could see the box spring and I don’t use a bedskirt with the wooden frame I have. This is an incredibly soft set and you can use this year-round. The color is fantastic and the product looks like the photos. We liked this set so much, we ended up purchasing a second set for our spare bedroom! BEAUTIFUL COMFORTER SET. IT LOOKS GREAT ON THE BED AND VERY SOFT. THE COLOR IS SOFT AND PERFECT FOR SPRING. Good quality and very nice finish to the material. Worth the price for a nice dorm room bedding. Bought this for my mom to go with a remodel bedroom. She loved it before she could even get it on the bed! Went perfect with the decor and the way it's pinched throughout made it drape over the giving it a touch of elegance. I bought quite a bit of bedding from Overstock. Although this comforter is esthetically nice it feels rather flimsy/poor quality. Don’t be fooled by prices. Spend an extra few dollars and buy elsewhere. Purchased as a gift for my niece. She loved the color and the material is so soft. the comforter is lightweight. The product shipped and was received on time for Christmas. This comforter set is very soft, but a bit thin. It's inexpensive though and I am overall happy with this purchase for my daughters room. "What are the measurements of the King set?" "Does this comforter come with a bed skirt? 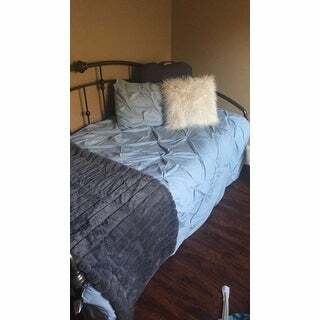 If not where could I purchase a bedskirt for this comforter set?" The comforter comes with 2 shams, no bedskirt. "I am inquiring about colors. 1) Is the blue more of a light blue or a grayish-blue? 2) One reviewer said that the gray is more of a brown and darker than the picture. Is it more of a taupe? I am looking for a darker taupe." "Is the light blue a true blue or is it more of an aqua green? I ordered a comforter that looks identical from Wayfair in "Misty Blue". It arrived today and it is aqua. It's very green. I'm looking for a blue with grayish hue's. Thanks for your time." "What's the size and weight of the package delivered?" Approximately 10-14 inches high x 23 inches wide x 16 inches long and weighs approximately 6-9 lbs depending on size. "Is this lightweight/all season or heavier weight? Is it machine washable?" It is an all season- but warm enough for winter. It is machine washable. The student I'm ordering for chose it because she really like the colors! I wanted a new comforter set at a good price!